Glen's flow law is for pure, isotropic ice. 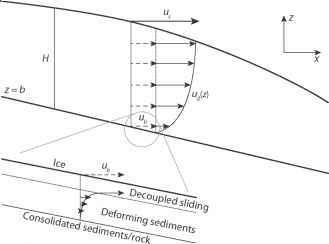 There are numerous other complicating factors for ice deformation, such as anisotropic ice fabric, the potential impact of grain size, and the presence of impurities and intergranular liquid water content. These effects are not explicitly resolved in ice sheet models, so the flow rate parameter, B0, is typically tuned to approximate the bulk effects of crystal fabric, grain size, and impurity content. Even without this level of detail or complexity in modeling ice rheology, there is tremendous variability in the effective viscosity of ice associated with the range of ice temperatures and stress regimes found in Earth's glaciers and ice sheets. Figure 6.4b plots the effective viscosity variation with depth at sample location in the Greenland ice sheet, as calculated from (6.10). The strain rates in (6.12) or (6.13) can be expressed as velocity gradients and then vertically integrated or inverted and substituted into the momentum balance (6.6) to give a set of equations for the horizontal ice velocity. Various numerical solutions to these equations have been adopted in glacier and ice sheet modeling.